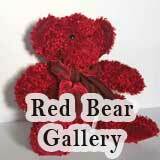 This Sweet Old Bear Was a Find at the Bargain Barn! This dear sweet old bear was a real find at the local bargain barn. When rummaging through the stuff on a table, he popped into my hand and I was shocked that this charismatic item, which has obviously been so well loved, was headed for the crusher if nobody rescued him! I took Teddy home and set out to see if I can find his origin, since I don't know much about bears. He bears no sign of having had any tags (pun intended). He's about ten inches tall with jointed head, arms, and legs. He may be mohair, but I can't really tell, although his fur appears to originally be a very reddish-golden brown. It is faded everywhere except towards the joint edges. His fur is worn, but not at all threadbare. The bottom of his feet are two ovular pieces of cloth, one of them stained. 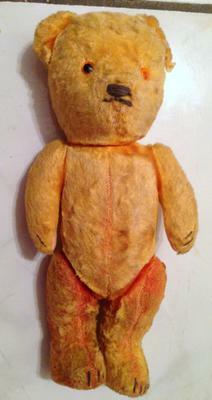 His arms and legs are somewhat short and stubby with three sewn claws on each. His nose is short and sort of smushed in, sewn using the same dark brown thread as his claws. I believe his stuffing, which is rather rigid, is what they call wood wool, but nothing is protruding to get a better idea. Teddy is in fairly good condition if he is indeed as old as I am guessing him to be. One of his ears had begun to detach and was reattached, but all other seams seem to be good and tight. 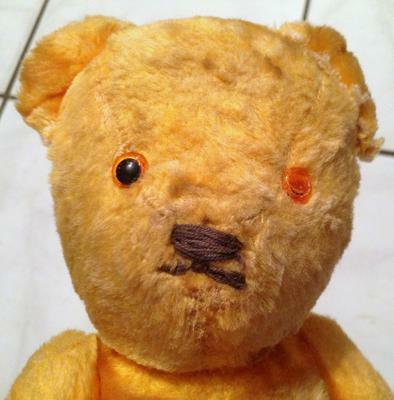 I guess Teddy must have had a retinal detachment because one of his eyes (glass? plastic? )is missing the center lens. What a gorgeous little bear, I love his golden fur. 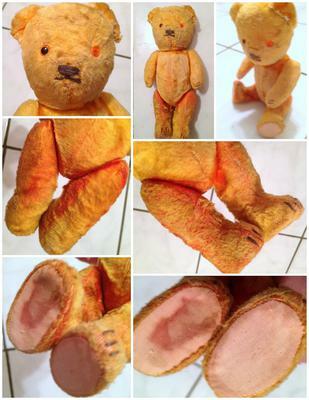 He certainly looks well loved, as all good teddy bears should be. Hopefully someone may be able to identify him for you. 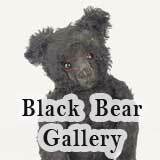 Comments for This Sweet Old Bear Was a Find at the Bargain Barn! 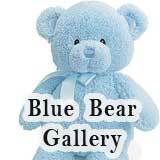 I know absolutely nothing about teddy bears and am on this site trying to find out about my own teddy- however, I saw a teddy just like this one on TV in England recently being professionally restored. Like yours, the one on TV had a pink hue around the joints where the fur is less faded and the expert said that it would originally have been pink. The one on the TV was a treasured possession of an old lady and they restored it (it was missing an ear) perfectly. I seem to remember that the restorer opened the teddy to save some padding for the ear that was being repaired and the beautiful pink colour was very visible inside. 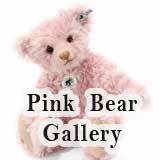 Very cute bear- I'd be tempted to think of it as a girl with being pink! 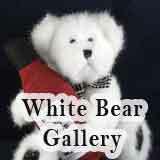 Your bargain barn teddy bear find is just adorable! He has a sunny disposition and sweet little grin. If I owned him, I would call him "sunkist". If you are ever interested in selling him, I would buy him in an instant. 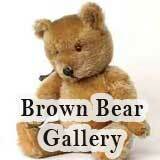 I have been collection teddies since I was 3 yrs old. I still have my childhood Teddies. If I owned him, he would sit right here beside me with pride of place. Congrats on a great find!